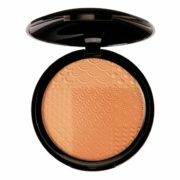 Nouba - Earth Powder Duo Bronzing Powder n - 35102Subtly tinted duo bronzing powder. Two natural shades harmoniously mixed in a glamorous mosaic with unique design. Perfect to enhance the skin tone. Provide a natural tanned finish and smooth and flawless application. Compact duo bronzing powder. Soft focus effect, natural finish. Corallina Officinalis Extract and tourmaline well known for their energizing properties. For a natural effect take a small amount of both shades with a medium-large rounded brush. Tap to remove the excess of product. Then apply the bronzer with circular movement stroking from the center outwards. To obtain a more tanned effect repeat the application several times until desired result is reached. Create light effects on the face stroking the lighter color over the entire face and blend the darker one only on the forehead, nose, chin and cheekbones.